My house sits on a slope of a mountain, and part of the land had to be excavated. I am thinking it's possible that when our house was built (1989)that some fossils were disturbed. This piece it quite heavy. Weighs about 16 lbs. Approx 9 inches tall. Would love to find out what this could have been from, obviously something very large! There must be more around my property. Any way to find out for certain? I can't give you any help about finding more. Just keep your eyes open especially after it rains. As far as identifying you naiad an expert. The local University if they have a paleontology dept or Rock hounds who collect in your area. Check for the closest gem and mineral club. They may have members who could help. Identification is difficult with bone fragments. I did confirm on a geographic map that my location is in fact in the Mesozoic era area. 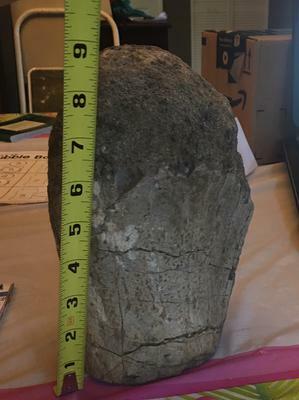 What can I do to find out what kind of possible Dino this came from? Thank you so much for the info Douglas! I was able to find an interactive geologic site for my area, sure enough my exact location showed on the map MzV, Mesozoic Era. How exciting! I am not sure how I can go about finding more of where this came from... what do you suggest? The rest could be hidden anywhere...could be under concrete for all I know. 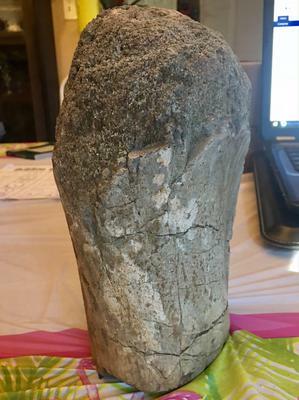 This sure looks like fossilized bone to me. 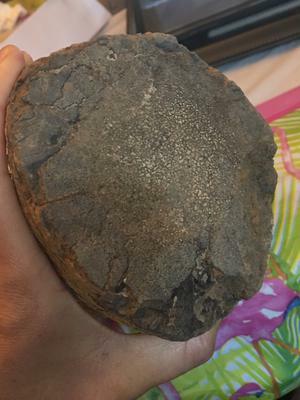 The bottom side appears to have the cell structure of bone. Check a geology map of your area. See if you can pinpoint your location on the map. This will help get the age of the rocks there. You are close to Mesozoic sedimentary rocks but I can't tell from the maps exactly where Grass Valley sits because the layers are pretty close together there. If it is Mesozoic you probably have dinosaur bone! And yes it is likely that there is more close by.